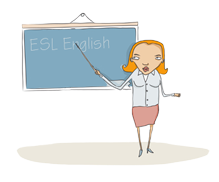 We can help you find English teachers (ESL, TEFL, EFL, TESOL) and English teaching jobs. Find teachers from native English teachers, or find jobs teaching in China, Japan, South Korea, Taiwan, South America or Europe. Find out why we have thousands of successfully matched jobs and teachers. Join as a member of ESL Jobs for FREE, and post your jobs or resumes today! Starts immediately: Public Primary School ESL Teacher Wantedâ€”Less workload, no office hours. Learn Mandarin Chinese and Teach English!